The line ‘wrapt in a brown mantle’ is taken from T.S. 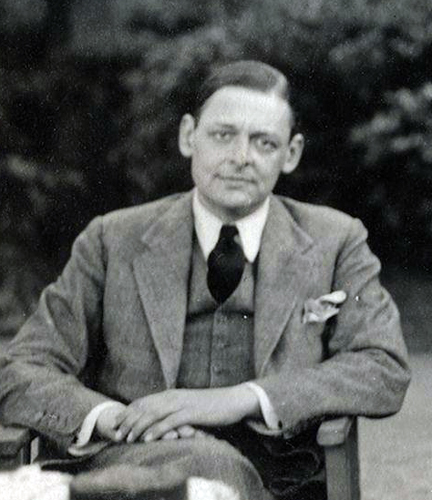 Eliot’s poem The Waste Land. It is part of a section (lines 359-365) that was inspired by an experience Sir Ernest Shackleton had on one of his expeditions. Detailed in his book South, Shackleton describes how he was convinced that he and his colleagues were joined by an invisible presence on the final traumatic part of their journey. According to him, ‘it seemed to me often that we were four, not three’. Eliot may have been aware that there were other recorded instances of the ‘Third Man Factor’ – a kind of guardian angel presence, an unseen guiding hand for those in peril. Certainly the experience seems much more common than given credit for – something extensively covered in John Geiger’s book The Third Man Factor, which provides numerous accounts of the presence from the likes of sailors, climbers, polar explorers, even 9/11 survivors. Other references to the Third Man Factor can be found elsewhere, in particular the biblical parallels where Christ, resurrected, appeared to two of his disciples on the Road to Emmaus, and walks along beside them. more scientific/psychological attempts at understanding the phenomenon (third man as coping mechanism, for example). But such a phenomenon cannot be left to the vagaries of the faith or reason brigade, especially not when there are other stories that can and should be told about the Third Man. One only has to make reference to the likes of Jessica Benjamin, and her psychoanalytic concept of the ‘shared third’ to suggest that something else might be going on with the Third Man. I’ve argued before that the shared third finds its natural home in the relational world, but in order to make a decisive leap between the two concepts, the shared third must be considered as some form of presence, as a ‘thing’ that exists in its own right. Of course this is conjecture, but it is striking how the Third Man as experienced by so many, is experienced as presence. But not only that; as an unseen and also watchful presence. And is this not what the relational world is? An unseen watchful presence? The experience of trauma and peril may be such that the relational world manifests itself more clearly, more physically, such experiences coaxing the relational world out of its shadow existence. At the very least, this explanation is as plausible as any others so far put forward. Regardless, however we may want to configure the relational world – as God, as spirit, as ethic, as the Third Man even, they always seem to be different attempts at answering the same question, Eliot’s question: who is that on the other side of you?